Isabelle Anderson plays Prospero in the Riot Grrrls Tempest. Photo by Teresa Castracane. In The Tempest, Prospero, the former Duke of Milan, conjures a storm that causes his brother-usurper and the co-conspirators of his deposing to shipwreck. In separated groups, they wash ashore the magical island which has sheltered Prospero and his daughter through the years. Prospero is then free to direct his vengeance or mercy upon them as he wishes and dictate the path their stories, combined once more, will take moving forward. This production is filled with well known and new coming actresses alike. Veteran actress Isabelle Anderson plays the powerful Prospero. Her sage and mystery are immediately apparent in her characterization of the deposed nobleman, as is her love of Miranda and her desire for justice. 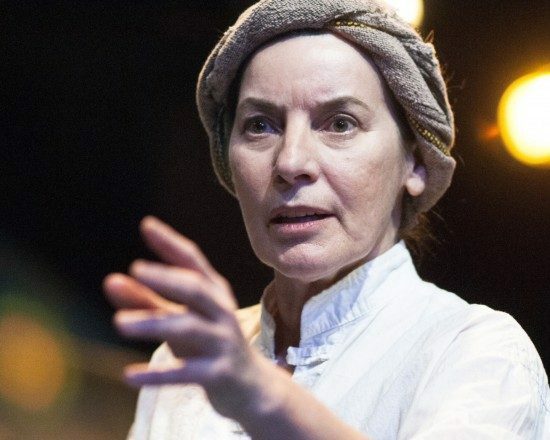 Tonya Beckman gives deeply entertaining and evocative performances as both the indentured, goodly spirit, Ariel and the enslaved, raging Caliban. In keeping with this tendency to double the actresses’ roles with one “good” and one “bad” character, Amanda Forstrom plays both a drunkard servant wrecked onto the island as well as the innocent, wild-child Miranda who is swiftly smitten by Ferdinand, the Prince of Naples. Played by Teresa Spencer, Ferdinand is honorable and true, and tries his best to keep hands-off his newfound love. Spencer also plays the plotting Sebastian, brother to the King. Toni Rae Salmi plays both the King’s noble butler and a drunken councilor in a performance sure to keep the laughter rolling. Francesca Betancourt and Emma Lou Hebert each play sailors and island spirits, and in their role as spirits bring the island itself to life. Finally, the cold and caluclating brother of Prospero, Antonio, is brought to frighteningly real life by Esther Williamson and the King is regally played by Aaryn Kopp. Anderson plays Prospero as a character beyond gender. As she puts it, “Prospero is a character beyond ‘man’ or ‘woman.’ He’s at that place in life where male and female meet in wisdom and true power. He is—like all of Shakespeare’s characters—a glorious expression of the human condition.” Her portrayal of this quality in Prospero was excellently executed, though it was initially confusing to observe the decided femininity in the character when expecting the rendering to be fully masculine. Of course, what better time to play with questions of gender fluidity than in an upside down production of The Tempest? Beckman’s experimentation of light and dark, cheerful and angry that we see in her portrayal of Ariel and Caliban each was both fascinating and highly entertaining. Where Anderson’s Prospero was not quite man, Teresa Spencer’s portrayal of Ferdinand was believable, endearing, and (dare I say), slightly crush-worthy. So too her portrayal of Sebastian, especially if you prefer the more “bad boy” edge to your crushes. It was Esther Williamson’s portrayal of Antonio, who usurped the dukedom of his own brother, Prospero, that stole the evening’s performance for me, however. Williamson played Antonio with such power and emotion that the character commanded attention each time she, all man, took to the stage in her striking suit, swaging walk, and smooth words–and so, too, when she sat to the side and silently wept real tears for the loss and, perhaps, forgiveness, meted to her. The Tempest is an ambitious production that tries very hard to do a great deal in a little space. It includes original music, singing and dancing by the actresses, and an imaginative staging and set that wraps through the room and recreates itself repeatedly as ship or cell and more. The interactive effect of the small space helped bring at least this member of the audience further into the production and enhanced the effect of an island alive with mysterious properties. The production crew rounds out the cast: Lise Bruneau, director; Kelsey Mesa, assistant director; Jessica Moretti, scene design; Brittany Diliberto, lighting design; Tessa Lew, Costume design; Amy Doningues, composer; Sara Jane Schmeltzer, sound design; Rebekah Carmichael, stage manager; emily Lippolis, prop design; Catherine Ritter, dramaturg; Victor Reinsel, production assistant; Missy Hamblet, production assistant; Katie Murphy, production assistant; Anna Lathrop, production assistant; Christian Deegan, production Assistant; and Daniel Flint, scenic artist. Seeing The Tempest played by an all female cast was certainly an interesting experience, and one that if you haven’t tried, you should consider. It provided the players, directors, and crew alike an opportunity to create a rather upside down experience. Characters are plumbed from new perspectives and create a layer of “otherness” to a well-known production. In the end, after all, “we are such stuff as dreams are made on,” and this is a very dream-like production. Running Time: 2 hours and 15 minutes, including the 15-minute intermission. The Tempest runs through February 28, 2015 – on Wednesdays, Thursdays, Fridays, and Saturdays at 7:30 PM with additional 3:00 PM Saturday matinee on February 21 and February 28. Taffety Punk Theatre Company is the resident company at Capitol Hill Arts Workshop (545 7th Street SE, Washington, DC 20003 – two blocks from Metro’s Orange/Blue Line stop at Eastern Market. Tickets can be purchased online for $15 at taffetypunk.com or at $7.50 if a woman brings “a dude who says ‘grrrls rule’ at the door”–in which case he plays full price and she gets in free. For tickets click here. Heather Hill recently decided to live on the hill and moved to DC. Although she comes from a nomadic background, one of the mainstays of her life has been the world of performing arts. She has also performed in, directed, and designed for multiple shows, including "A Christmas Carol", "Arsenic and Old Lace", "Midsummer Night’s Dream,” and “The Merchant of Venice." Currently, she works at The Kennedy Center by day and writes by night.